It looks like a henna tattoo, which I’ve had many times before, and loved. Tattooed friends tell me that they’re proud of me; others are agast or somehow disappointed…but I did it for myself. I’m finally to a point in my life that it’s okay if other people don’t agree with my personal choices. I loved the artist, Jeff, the owner of Inxon in Cottonwood….who was very down to earth, talented, and not scary at all…plus it didn’t hurt nearly as much as I expected. A dear friend went with me, and believe it or not, it was really a very pleasant experience. Truth is, I’m feeling very feminine and and totally jazzed! ~ by Dawn Elliott on September 30, 2011. Yay for doing something so uniquely You for yourself. I am thinking of one for my 50th which is in 5 years. I need to find the right design though. Enjoy your body art ! It is lovely. Absolutely do what you feel is best for you. I love it Dawn, it’s just beautiful. I’m at that point in my life where I feel the same and with so few years remaining in my life, I want to do what I want. Happy days to you Dawn, always and forever. I love it Dawn! It seems to fit you perfectly. I’m happy for you. It looks graceful and feminine. I’m in the mood for a new tattoo myself but haven’t set aside any money toward it. Here’s hoping I get jazzed up enough to do it. Wow! Love the image!! I stick with my ‘sticker tattoo’s’ (always on my foot too, and images alike yours..) The haiku says it all… go girl!!! it’s beautiful Dawn! I love that it looks like a henna design, nice choice!! Wherever you are, there “art” thou! Lovely haiku and tattoo. Totally understand the rite of passage….I have 2 tats the first one I got at age 21 a small bird….the 2nd tat at age 50. 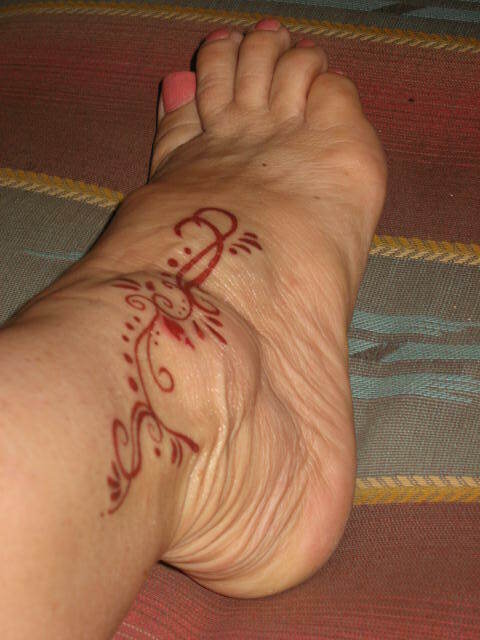 Beautiful henna tattoo, Dawn. I love those designs. I think they have a great deal of meaning in the culture from which they originate. I would like to learn more about them. The artist did a fine job on yours. It looks lovely. Great to do something for yourself that is meaningful for you!